The Ministry of Tourism released Incredible India Calendar 2017 recently. It has a beautiful picture of world famous Ratha Jatra of Shree Jagannath Temple (Puri) on its first page. 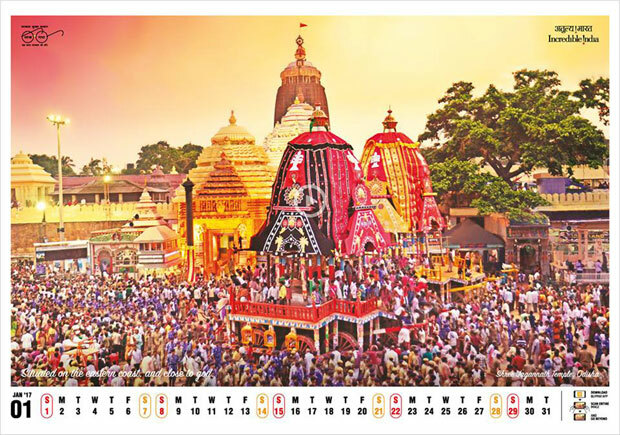 In this calendar, the ‘Puri Ratha Jatra’ picture is used for the month of January. It is supplemented with a beautiful quotation printed on it – “Situated on the eastern coast, and close to God – Shree Jagannath Temple, Odisha”. Discover a new India that you have never experienced before. With Incredible India’s innovative calendar for 2017, you can experience multiple destinations by scanning the calendar images using Blippar app. Download the Blippar app, scan the image & Go Beyond Incredible India. This year’s wall calendar has a total of 12 photographs, one for each month, as well as a list of government holidays and other important days. The full calendar can be viewed online here.